Are you a YouTuber and you can want to record your screen. Are you looking for best screen recorder apps for android? 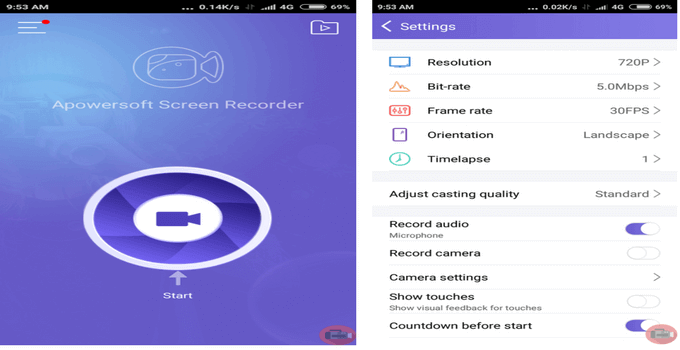 Today I am sharing with you 10 best screen recorder apps for Android that help you to record your screen. If you a game lover and playing games and you can want to record your game screen. So today I tell you best screen recorder apps that allows you to record your screen and share with your friends. Some mobiles and tablets come with screen recorder feature. Check out some apps list that today I am sharing with you in these post. These best apps record your screen with HD quality on your android mobile. Screen recording is a importance for android mobile users. You can choose any of the screen recorder apps for your android mobile. Az screen recorder app is best to screen recorder app. It is available free on google play store. You record your screen in HD and full HD quality. Less screencast app on the android market that can be paused and resume while recording. Overlay front camera that records your face into small overlay window and drags it freely into any direction of the screen. No time limit: unlimited recording screen. No watermark: On the recording video screen no watermark show. Ads free: no ads show on the recording screen. No root require: it work without root. Countdown timer: the countdown timer is started when you have prepared before recording. overlay front camera: you can record your face into small overlay window. Draw on screen: you can emphasize or draw a mark with chosen color on the recording screen. Trim videos: the screencast can be long and you can trim the unnecessary part of the screencast. It is offered by hecorat. It works on an android lollipop. It has over 10 million downloads with 4.6 rating points. 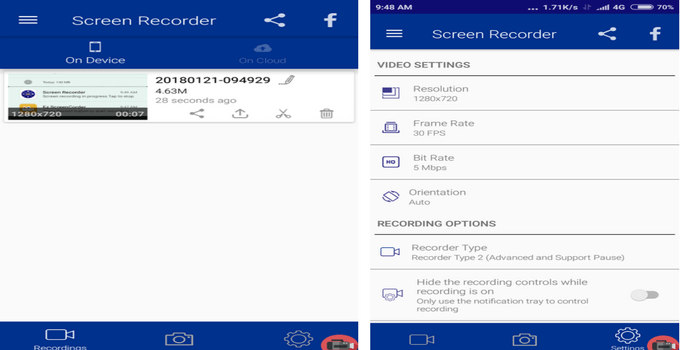 DU recorder app is free high-quality screen recorder app is available for Android. DU recorder is lots of video editing features that can help to create better videos. It is different than other screen recorders. It provides stable and fluid screen recording. Totally free without in any app purchase. No ads show in DU recorder. No root require in DU recorder. It works without root. No recording time limit record screen unlimited. 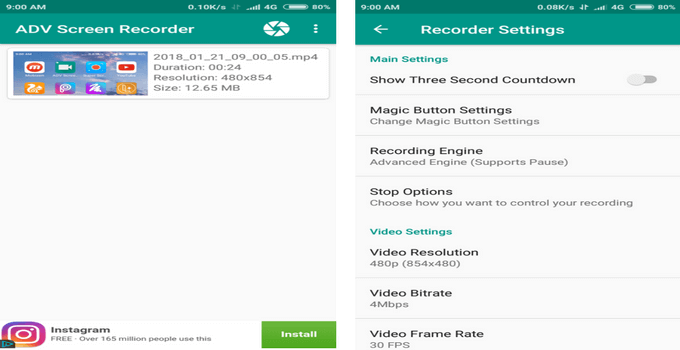 Screen Recording: with these screen recorder, you can record popular mobile videos and games. Many resolutions, frame rates, and bit rates available support for HD video. It has over 10 million downloads with 4.8 rating points. It has offered by screen recorder and video editor. Record screen for making popular videos and record trending games 100% free. It is easy to use. It allows you to record your screen, capture, and edit. Clear screen recording in full HD. Choose video resolution from 240p to 720p HD. Select frame rate 5FPS to 60FPS. Record a clean screen without a watermark with the clean recording mode. Video editing features (trim, cut, images). No rooting starting from os 4.4. Capture your reactions freely while recording game sound and your voice with facecam. It has over 10 million downloads with 4.3 rating points. It has offered by Mobizen. ADV screen recorder is most of the complete screen recorder on the market for free. 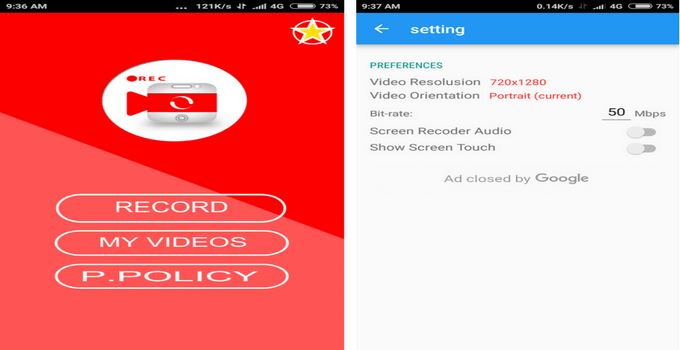 ADV screen recorder was designed with fully featured, without any kind of restrictions. No root required in the ADV screen recorder app. Its video resolution starts from 240p to 720p. Its video resolution is 2Mbps to 15Mbps. Select frame rate from 24FPS to 60FPS. Draw on the fly with your favorite color. Use Front or Back camera while recording. Set your text for full customization. Set your banner with full customization. It has over 1 million downloads with 4.4 rating points. It has offered by ByteRev. Its pro version is available in rupees 20 only in-app purchased. Record your screen with just one simple click. 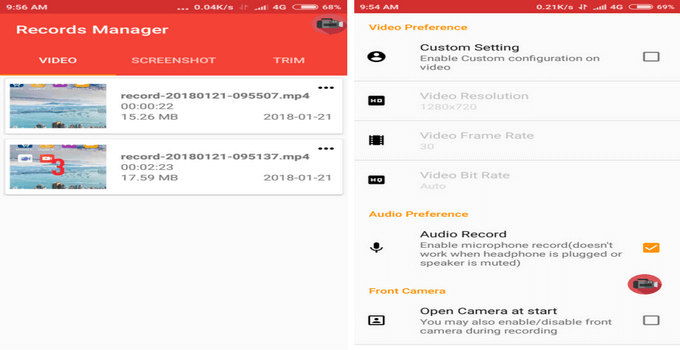 EZ Screen recorder help you to record your screen easily. You could record your game screen, live chat, live streaming, live broadcasting and etc. All of the EZ screen recorder features and functions are totally free. No root needed in the EZ screen recorder. No ads show in the EZ screen recorder. Front camera recording- Customizable front camera preview window that can be placed anywhere in recording screen. Mic recording- record your voice in real-time. High-quality recording- Record with HD quality (720P, 1080P), multiple bit rates and fps are supported. Instant sharing- share your videos to WhatsApp, youtube, and twitter. It has over 100 thousand downloads with 4.7 rating points. It has offered by Aaron XYZ. It supports Android 6.0. 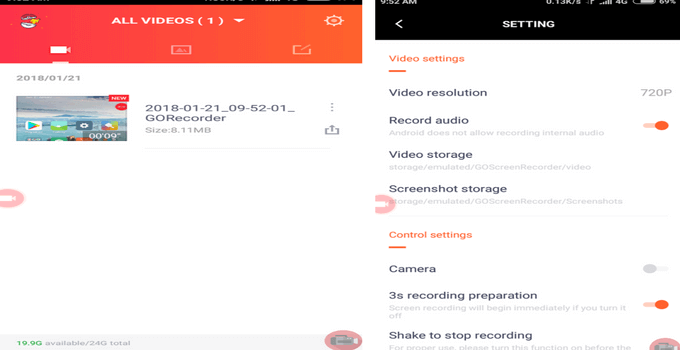 Screen recorder is a free easy to use screen recording app to record and capture your mobile screen. You can record your games, video, live chat and other live shows. You can use the front and rear camera. You can record unlimited mobile screen. Record youtube video and compress it. Select video resolution 240p to 720p. Select frame rate from 25FPS to 60FPS. Select Bitrate from 1Mbps to 12Mbps. It has over 500 thousand downloads with 4.6 rating points. It has offered by AppSmartz. It is one of the best professional screen recorder app. Record screen in full HD. It allows you to record your screen with HD screen. You can record Live shows, games and youtube video. All features are work free. It records phone screen with 1080/60 fps quality. No root required in super screen recorder. No time limit record unlimited. Gif maker: Convert your recorded video part into an animated GIF file. It is offered by happy bees. It has over 100 thousand downloads with 4.5 rating points. Its pro version is available in rupees 190. It records whatever show on your mobile. You can directly share video via WhatsApp, facebook, twitter and youtube. Its recording resolution is 360P.480P,1028P. Its frame rate is 24fps to 60 fps. Its bit rate is 1 MB to 12 MB. It allows you to take a screenshot with overlay icon. It supports the back camera. The countdown starts from 1second to 30 seconds. It has over 500 thousand downloads with 4.2 rating points. It has offered by APOWERSOFT LTD. It supports Android 5.0 and higher. You can easily record popular mobile games video. You can record video chat, games, youtube videos and other live broadcasts. 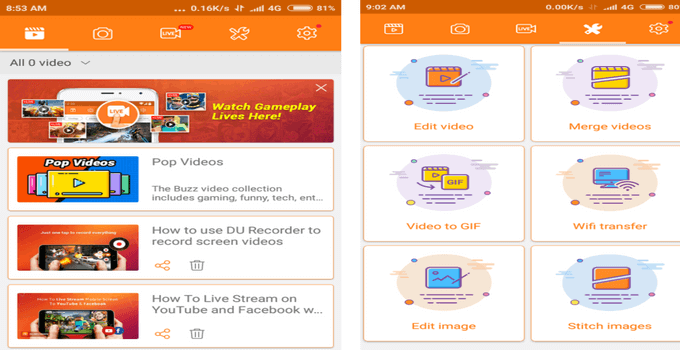 It is not only a screen recorder it is a video editor and also an app to capture screenshots. You can upload files from mobile to PC. Hide the floating window when record. Select video resolution 480p to 1080p. Turn on record audio in setting to record audio. It has over 100 thousand downloads with 4.1 rating points. It has offered by GOMO P.
Record your screen in an easy way. Record video tutorials, video call, youtube video and much more. It is completely free. Automatically identify the game on your mobile. Its video resolution is 720×1280. Ads free no ads show. No time limit record unlimited time. It has over 500 thousand downloads with 3.5 rating points. It has offered by jonhattab. I hope you like these 10 best screen recorder apps. If you like these guide, share with your friends. I can use DU recorder for screen recording. These apps are specially designed for YouTubers and gamers. 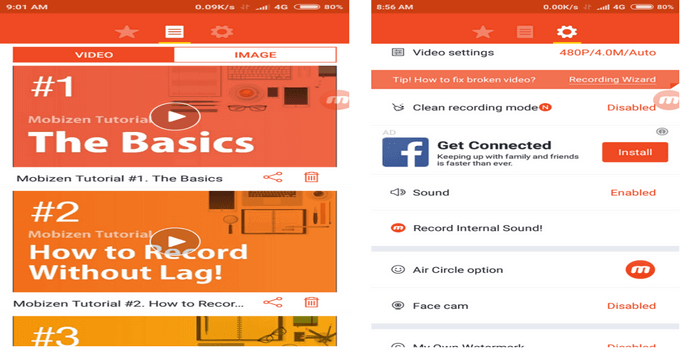 Record your screen with no time limit anytime anywhere with these screen recorder apps. If you have any question and problem comment me below.